Repaired tyres are only suitable for temporary use. The Tyre Mobility System is NOT suitable for repairing this type of damage to tyres. Your vehicle is equipped with a tyre repair kit: the Tyre Mobility System (TMS). In the event of a puncture you will find the TMS, which consists of a sealing compound and an electric compressor, located under the floor panel in the luggage compartment. The TMS will reliably seal tyres damaged by foreign bodies, provided that the cuts or punctures are no larger than approx. 4 mm in diameter. It is not necessary to remove the foreign body from the tyre. 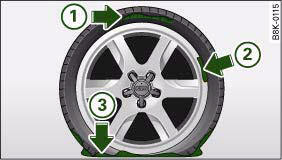 • if you have been driving with very low pressure or a completely flat tyre 3. How to use the TMS is described in the section Repairing a tyre and in the instructions supplied with the tyre sealant can. The TMS can be used at outside temperatures down to – 20 °C. • Do not drive faster than 80 km/h. • Avoid heavy acceleration, hard braking and fast cornering. • Vehicle handling could be impaired. • Tyres which have been sealed using the TMS are only suitable for temporary use. Damaged tyres must be renewed. • Seek professional assistance if the repair of a tyre puncture is not possible with the sealing compound. • Do not allow the sealant to come into contact with your eyes, skin or clothing. • If you do come into contact with the sealant immediately rinse the eyes or skin affected with clean water. • Change clothing immediately if it becomes soiled with the tyre sealant. • Make sure you do not breathe in the fumes! • If any of the tyre sealant is accidentally ingested, immediately rinse the mouth thoroughly and drink lots of water. • Do not induce vomiting. Immediately contact a doctor! • If any allergic reactions should occur get medical help immediately. • Keep the sealant away from children. Used bottles of sealing compound can be returned to an Audi dealer for disposal. • If sealant should leak out, leave it to dry. When it has dried, you can pull it off like a piece of foil. • Observe the expiry date stated on the sealing compound can. Have the sealing compound exchanged by a qualified workshop. – If you have a flat tyre, stop the car well away from moving traffic. – Apply the parking brake to stop the vehicle moving accidentally. – Engage first gear (manual gearbox) or move selector lever to position P (automatic gearbox). – Check whether a repair is possible using the Tyre Mobility System. – Ensure that all passengers leave the vehicle and move away from the danger area ⇒ . – Take the tyre sealant can and the electric compressor out of the luggage compartment ⇒ page 283. – Fix the sticker “max. 80 km/h”, which is included with the tyre sealant can, onto the instrument cluster where the driver will see it. – Shake the tyre sealant can well. – Screw the enclosed filling hose onto the sealant can as far as it will go. This will automatically pierce the foil sealing the can. – Take the valve cap off the tyre valve and use the enclosed valve insert tool to unscrew the valve insert, fig. 270. – Place the valve insert onto a clean surface. – Remove the sealing plug from the filling hose and insert the hose into the tyre valve. 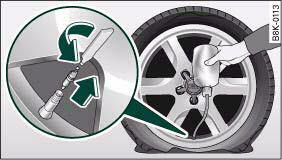 – Hold the tyre sealant can upside down and fill the complete contents of the can into the tyre. – Then disconnect the hose and screw the valve insert firmly back into the tyre valve. – Screw the filling hose of the electric compressor onto the tyre valve and plug the connector into the cigarette lighter. – Pump the tyre up to 2.0 to 2.5 bar and monitor the pressure shown on the pressure gauge. – If the tyre pressure remains lower than the value specified above drive the vehicle approx. 10 metres forwards or backwards, so that the sealant can spread evenly in the tyre. If the pressure is still lower than the specification the tyre is too badly damaged and cannot be repaired using the tyre sealant. – After about 10 minutes stop to check the tyre pressure. – If tyre pressure is less than 1.3 bar, the tyre is too badly damaged. Do not drive on. You should obtain professional assistance. • If you have a puncture in moving traffic, switch on the hazard warning lights and place the warning triangle in a visible location. This is for your own safety and also warns other road users. • Make sure your passengers wait in a safe place (for instance behind the roadside crash barrier). • Please observe the manufacturers' safety notes on the compressor and the instructions supplied with the tyre sealant can. • If it was not possible to build up a tyre pressure of 2.0 bar within 6 minutes this means that the tyre is too badly damaged. Do not drive on. • If tyre pressure is less than 1.3 bar after driving about 10 minutes, the tyre is too badly damaged. Do not drive on. You should obtain professional assistance. Take special care if you have to repair a tyre on a gradient. • Do not use the compressor for longer than 6 minutes at a time, as it could overheat. When the compressor has cooled down, you can use it again. • If tyre sealant should leak out, leave it to dry and then pull it off like foil. • After carrying out a tyre repair remember to buy a new tyre sealant can at a qualified workshop. This will ensure that the Tyre Mobility System is operative again. • Please observe the relevant regulations.